October 12th Scent, originally uploaded by indiaeden. While I was pregnant with Florence, I upcycled an old cupboard given to me by a dear friend, to keep all the baby things in. I gave it a shabby chic paint effect and lined all the drawers and shelves with cath kidston rose scented drawer liners. I don't usually like scented things. I'm very sensitive to artificial smells, they trigger migraines in me, but these drawer liners are subtle and don't affect me in that way. 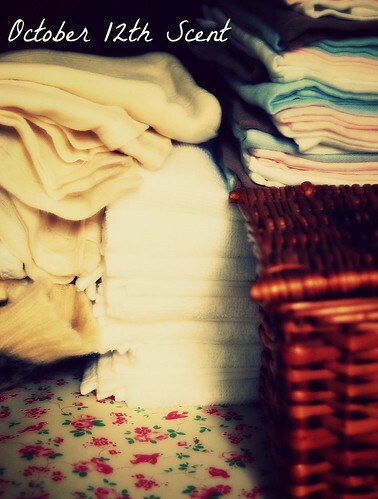 Over the months I stocked the cupboard with nappies, and bootees and clothes, they all took on the smell of the liners. After Florence was born, I had a little super soft organic washcloth from the drawer that I would hold over my face and breath in the scent. I never had time to breath in Florence's baby scent, and sadly the clothes she did wear were washed before they were returned to me after the post mortem. I don't know how she smelled, and so this smell of the drawer liners is, in my mind her smell. The washcloth has long since lost it's smell, and the cupboard now holds all of Ernest's things, (though we all still call it "Florence's cupboard" ). I lined Florence's memory box with the liners that were left over, and on the rare occasions I do open her memory box, I take in a deep breath of the heavenly smell of my baby. Once or twice I've been out and about and caught a whiff of the same scent, someone passing me in the street who perhaps has stored their clothes with the same liners, and it always stops me in my tracks, makes me smile, it's like a little "hello". ...it always stops me in my tracks, makes me smile, it's like a little "hello". Your deep and beautiful posts all through this project have touched my heart so much. It is blindingly clear how dearly Florence is, and always will be, loved.